How will you know your business is excelling? What small steps can you take now to move in the direction of having a more balanced approach toward professional success? How would your customers react when your business is not only meeting, but exceeding their needs and desires? If you are having trouble coming up with answers to one or all of these questions, here is a simple way to get the ball rolling – Your Business Wheel. You may be surprised how simple it really is! In sticking with the theme of Yourevolution, the wheel exercise is the perfect tool to prioritize, balance, and create amazing change. This will empower you to build a solid foundation and the business of your dreams. Even more incredible is that this simple exercise can be completed by any business owner or executive, anywhere, and at any stage. Why Use the Business Wheel? 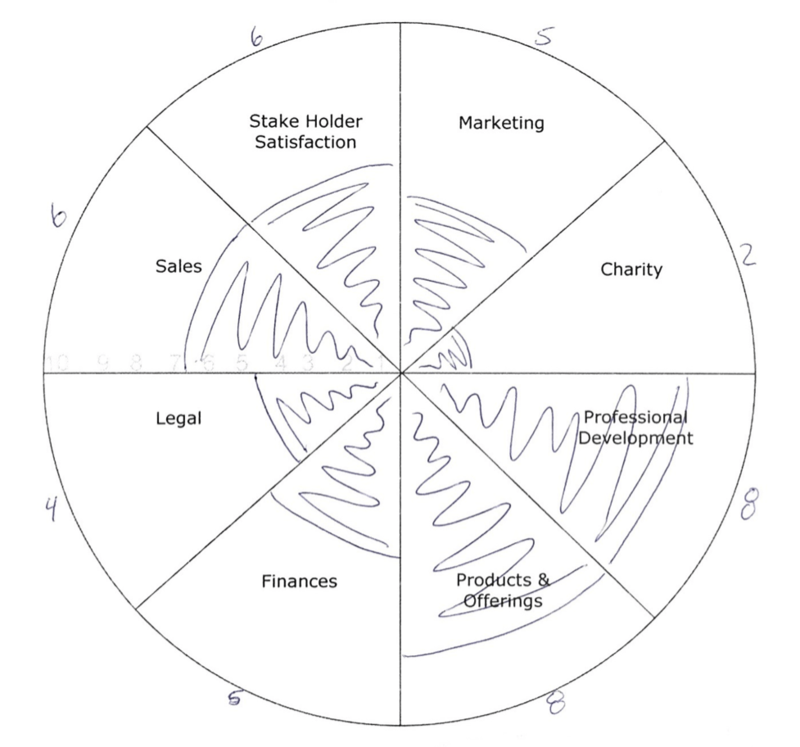 The wheel is a great tool that will help you see your company from a birds eye view. Balance and direction are important, no matter what stage your business development is in. Once you dive into the process, you’ll quickly notice which areas of your business could use some fine tuning, which ones you are more satisfied with, and also highlight any areas that may need more of an overhaul. Through prioritization of all aspects of your business, you will gain a better balance, boost your overall performance, and begin steering your company toward all around success. Anyone and everyone! From a single owner start up, to a well-established multinational corporation- every single business can benefit from the prioritization and balance this exercise provides. Brainstorm several key areas or categories that are currently instrumental in your organization. These areas or categories are your choice. Each organization is different and the key to this brainstorm is to select areas that are essential and/or significant to YOUR business. Aim for at least 8 of your most important areas. Here are a few examples: Sales, marketing, products, employee skills, administrative, charity work, customer value, professional/personal development, finances, employee fulfillment, stakeholder satisfaction, etc. You are welcome to use this wheel or draw your own. 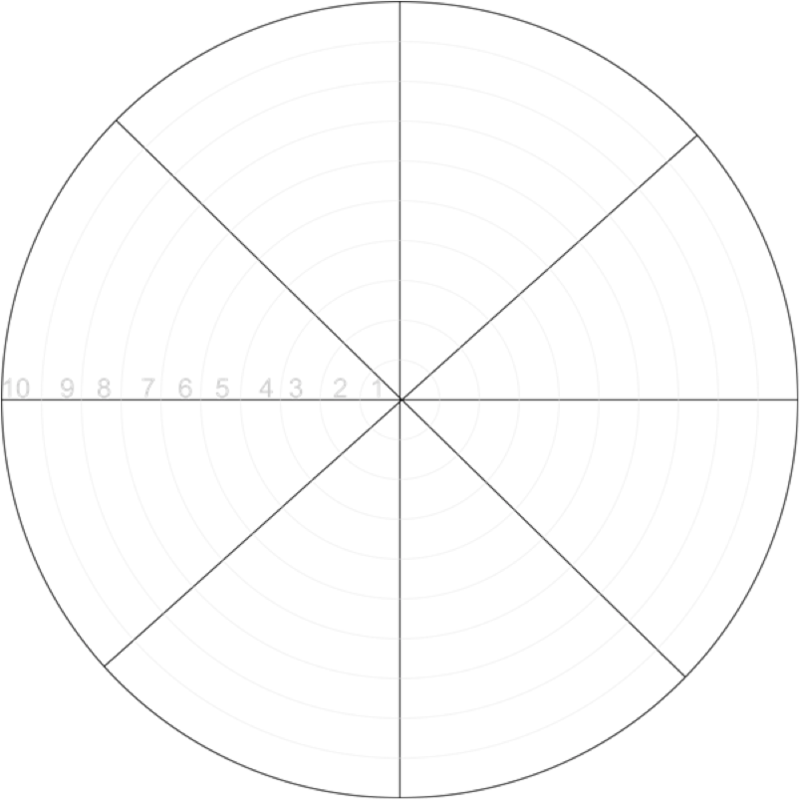 The wheel provided here has 8 sections, but if you have more- draw your wheel with the same number of “slices” as you have categories. Now fill in each slice with one of the categories. Step #3: Rate each of the categories. Now, rate the current satisfaction you (or your group of company leaders) have for each category. Ratings are based on a 1 to 10 scale: 1 being barely satisfied at all, and 10 being fully and completely satisfied. I like to write the number on the outer edge of each slice, but feel free to write the number wherever is most convenient for you. Shading each slice is very important. This is a visual exercise that helps you find balance in your business. You may keep it sleek and simple with a single shade (black/blue/etc), or you may jazz up your wheel with colors that relate to your business or the specific categories. Your choice! On the wheel provided in the document above there are thin gray lines, representing each level from 1 to 10. For each category, shade the slice to fit the rating which you chose in step 3. A barely satisfied level of one is just the very tip of the slice near the center of the wheel. If you are experiencing a level of 10, shade your entire slice, all the way to the outer rim. Step 5: What do you notice? Now is your time to step back, look at the wheel and take it all in. What do you notice about your business? This is your organization and your wheel. There are so many options when using this tool and applying it to business practices. Some find it helpful to ask questions of themselves and those in leadership positions in relation to the overall illustration of the wheel. Examples may be: What are the areas that most need improvement? How might I/we prioritize which areas are most vital to improve? What are some small steps the organization and its leaders can take now to increase the specific areas which need the most attention? How is your business going change for the better if you balanced your wheel incrementally over time? Who else would benefit once these improvements are made and the satisfaction of all stakeholders is high? Now that you know the most beneficial areas to improve and have some ideas on how to do that, turn your ideas in to action steps. Action steps are goals, very small incremental goals. Ask yourself, or your organization’s leaders: what are the smallest of steps we can take now to make forward progress and increase the overall outlook of our business? These should be actions that can be taken in the short term and built upon. The key is to choose actions that are realistic and that your organization is committed to follow through on. Building a solid foundation and positive habits to keep your business rolling forward is vital. For amazing advice on setting actions that you and your business will achieve, read this short post. Step 7: Revisit your wheel! Set aside a specific amount of time to continue to implement actions and notice improvements in your business. After some time (several months or more) revisit the wheel and re-rate the categories. What has changed? How will you continue to improve the balance and overall satisfaction of your business’s performance? What steps need to be taken now? Then keep the process moving forward and revisit the wheel again. This exercise is limitless! What are your questions and ideas? How is your progress? Leave us a note on the comments below. As a bonus, check out this article on how to complete this same exercise on a personal level. The same fundamentals apply, only the subject is your life! When you are ready to find balance and prioritize your personal life so that you can live your most extraordinary life, take the helm and take charge with your Life Wheel.